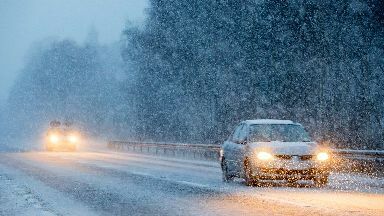 The wintry weather is expected in northern parts of the country with snowfall reaching up to 20cm. Weather warnings for snow and ice have been issued as blizzards are set to hit parts of Scotland this weekend. The wintry weather is expected in northern parts of the country with snowfall reaching up to 20cm in some areas. The highest risk will be above 100 metres, where the rain will turn to snow through Saturday. There is a smaller risk at lower levels, but a few spots could see 5 to 10cm. Areas which will be affected include the north Highlands, inland Moray and Aberdeenshire. Roads in the north Highlands will become dangerous by Saturday afternoon and into the evening with blizzard conditions. Other routes such as the A9 south of Inverness, A96 and A95, will also be affected by the snow later in the day. Those planning to travel in these areas have been warned to be prepared. STV Weather presenter Sean Batty said: "After a spell of colder weather this week the weather has turned much milder, with temperatures on Friday hitting 10C in parts of the west. "The milder weather isn't set to last though, with colder air returning south this weekend. "Rain will affect the west throughout Friday, which will move into northern parts of the country during Friday night and stay pretty much static until Saturday evening. "With the colder air starting to dig back in at the same time this will turn to snow." The cold weather is expected to last through to next week with a return of wintry showers after the rain and snow has cleared into the North Sea on Sunday. Sean added: "While the weather is looking very mixed for next week, confidence is high for the colder theme to continue, which means everyone should make sure they are prepared for further wintry weather." Inspector David Hynd said: "Police Scotland is advising all drivers to exercise extra caution throughout the Highland and Islands, Morayshire, Aberdeenshire and northern areas of Tayside as conditions may be hazardous due to snow and ice. "There is also the potential for high winds around coastal areas and exposed routes particularly in the north east of the country. "If you are travelling, you should ensure you and your vehicle are adequately prepared for the conditions making sure you have sufficient fuel and supplies such as warm clothing, food and water in the event you are delayed for several hours. "Charge your mobile phone and plan your route as well as alternative routes." A Met Office spokesman said: "Rain across northern Scotland on Saturday evening will turn increasingly to snow, at first over hills and then down to lower levels through the course of Saturday night. "Strong northerly winds will lead to blizzard conditions and drifting over high ground, where 10 to 15cm of fresh snow may accumulate. At lower levels, 2 to 5cm is possible, mainly inland and above 100 metres."